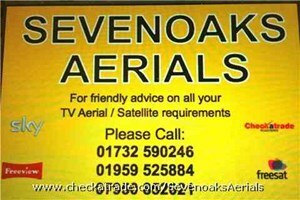 Sevenoaks Aerials - Alarms/Security, TV Aerials/Satellite Services based in Shoreham, Kent. SEVENOAKS AERIALS was established over 30 years ago and I have been the owner of it for the last 10 years. I have worked in this Industry for over 23 years and have a wealth of experience. I am an Approved Aerial Contractor & have a large customer base of Property Managing Agents, Builders & Electrical Contractors that use me exclusively. As such I have to comply with exceptional standards of professionalism and sensitivity. All my work is guaranteed with full Public Liability Insurance cover. I am more than happy to deal with requirements from extra TV points to complete SMATV systems for communal blocks. As we are a small family run business you are always guaranteed to speak to either myself (David) or Pauline and we are more than happy to discuss your requirements.